With the help of the Dubuque Area Professional Section, UW-Platteville will be hosting the Region H Conference on February 26th thru February 28th, just a short 2 hours from Cedar Rapids/Iowa City Area! 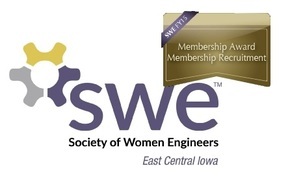 We would love to get a large representation from SWE-ECI! CHILDCARE IS AVAILABLE! If in need of child care, please email sweregionhconf@uwplatt.edu with the subject line of "Child Care" and they will send you more details. Yes & plan to stay overnight! Yes, but will only be there for Saturday Conference activities! Maybe, I have yet to decide. Unfortunately, No. Yes- I plan to drive up Friday Afternoon Yes- I plan to drive up Saturday Morning No- I will find my own way to conference- but see you there!